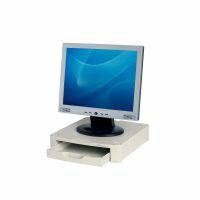 Monitor stand for LCD monitors up to 15kg, brings monitor to a comfortable working height for viewing, by 67mm. Units can be stacked to bring to desirable level. There is a useful storage drawer under monitor for paper or sundries.